I have been experimenting with slow tech advancement. So each "era" lasts longer. I start with a tribal start that has very tweaked settings so I start with no items and the 5 starter pawns have no clothing. 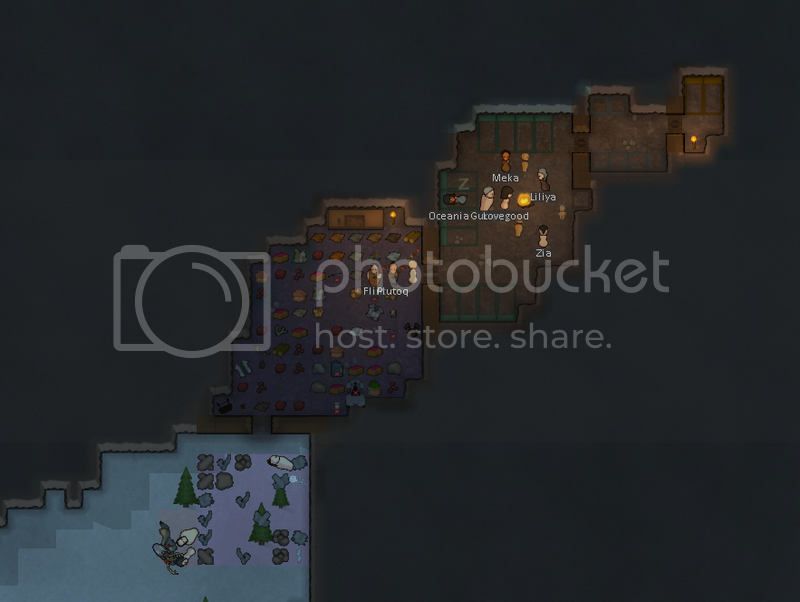 I made myself a modified neanderthal mod and gave a male and a female to start with my 5 starter pawns. They are t represent children and laborers since they can breed. As you can see they are each worth points from 1/2 to 6. The number above on the eras are worth that many points. You start at Australopithecus which is 0. If you had a Tribal Raid and survived then you could advanced to Homo Habilis (1). But if say you were attacked by a Space Raid (3) then you could skip all the way to Homo Erectus (2) since Homo Habilis cost 1 point and Homo Erectus cost 2 points. - When a baby wolf is born you can trade it out with a husky of the same gender (use debug mode). - Can build stuff from the RIMkea mod - Rustika line. - Should be leaving the cave and building Hut and other small Buildings. Basically you cannot do anything not stated in the lists. I do allow for things like cleaning and healing. But I am not sure if I should. In my game I found a natural canyon and built a roof over the top to say its a cave. I think that kind of non-digging is ok for the early eras. Also the issue of items not from your era that you obtain though raids or drops or just NPCs dying on your land. And my stance now about it is that you just cannot use it until your reach the appropriate era. So you find a gun or armor or just a cowboy hat. Sorry you can store it but you cannot use it yet. Research is limited to doing neolithic techs first. And some techs will not be able to be research until the appropriate era. If you want to try this yourself please give feedback. Likewise if you have some ideas let me know. I will be posting more eras later as I progress through them. It does sound interesting. Less like a survival game and more like a history story. I like the idea of certain things being triggered like the fire tech being triggered after you encounter fire. I could imagine playing this and settling in a certain era, spreading out and doing the most with that eras tech. Then something triggers an advancement in era and new tech becomes available and i have to start incorporating it. The base was working as it was but the new tech just improves everyone's lives. I am a bit worried that too many levels will put people off. Well its defiantly a slower paced game. It still feels like survival since you have to get by with what you are allowed to do. As for the many eras, that was on purpose so you feel more gradual growth. As opposed to the fast paced clubs now, next year solar panels! I also have been playing on a Boreal Forest so the seasonal environment really impacts you when you have no clothing. Fire in caves basically is the only way I survived. Then grabbing animals who froze to death to make my basic clothing. In another test before this I tried in the jungle and kept getting eaten by predators. Which while realistic, gets annoying. Here is the cave in my test during the Homo Erectus Era As you can see the "cave" is not dug but natural. Log walls were put in to keep out the cold. The stockpile has no door so it can stay cold but still under a roof. I do have a mini jail for prisoners. I am not sure if I should allow them from the start or not. For now I am just testing how they work with such low tech. Which while realistic, gets annoying. Keep an eye on that. In the end this is a game and should be enjoyable. If something is "really annoying" it should probably tweaked to be less so, even if it is realistic. I don't know about ignoring higher tech that falls in your lap. On the one hand they didn't make it and can't reproduce it but maybe they can use it. Then again if you could make it so low techs "can't" use higher tech, that could work too. They could just hold on to the item until they understood how to use it ie. they level up. But how would you even implement that? I think it would be difficult or even impossible to stop a pawn from using an item. The only limitations i have figured out is either don't build it or give your pawns limited clothing options. X out any items that is off limits and the best thing is just sell it. If you don't have it anymore you are not tempted to use it. You can also just not allow the pawns to have restricted jobs. Such as if there is now hunting discovered yet then don't assign anyone to be the hunter. As for the fun vs annoying. For me it has been a lot of fun. It feels like a new game playing this way. I was hesitant to share my experiment. But I thought maybe others would have ideas I had not come up with yet. Again this style of play is not for everyone. I updated the list with the Copper and Bronze Age. I am currently in the Stone Age in my game. I have adjusted the list above based on more research and game balance. I had a few big events happen at once so I jumped quickly from Homo Erectus to Homo Sapiens / Prehistoric to Stone Age. I am not sure how balance wise that was but having a raged weapon for hunting and the ability to fish has really helped when there is no food to forage and I cannot grow crops yet. It's Been awhile, and I was wondering if this list will be expanded, plus a new mod list?